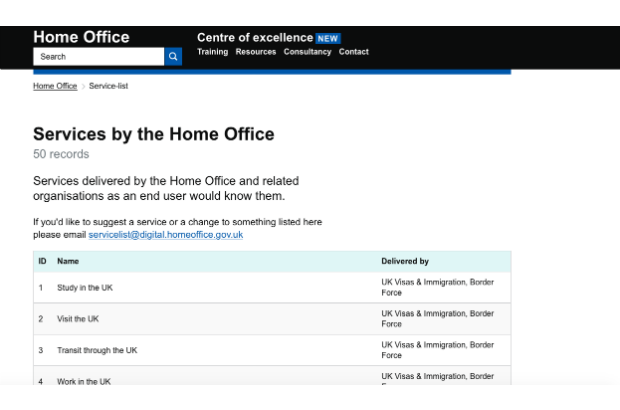 The Home Office is developing a list of services it delivers, or delivers a part of, as an end user might know them, or might search for them online. By end user, we mean citizens, visitors, people living here from abroad, employers, universities, airlines, port operators and many more. Some of the services in this list are large, complex end to end services that cut across many organisations. Some are smaller transactions. Why make a list of services? Government provides services to external users as part of achieving policy outcomes. There’s a lot of service-related content on GOV.UK. It makes sense to be clear about which services are being provided and to have a single source of them. Having a list is a precursor to knowing things about these services: their size, how much they cost to deliver, how they’re performing in terms of desired outcomes (for users, for policy, for the organisation), whether they should exist in their current form, whether there are patterns that are duplicated, who owns and manages them. Since organisations have many ways of understanding their internal workings and capabilities, this list provides an important external reference that much of the internal work should align to, and work together over time to help achieve desired outcomes. Changes to the Digital Service Standard mean that delivery teams will need to know which end to end service – or services – their project impacts, or aims to improve, and how. If we don’t have a single agreed list, we’ll end up with a plethora of confusing names. We can map existing delivery or ‘change’ work to these services. If we know why each service exists and what good looks like for each service, service type, or individual stage within a service, it will help us be clearer about what individual projects should be trying to achieve – at least, for those that relate to a service. This list is a work in progress. We know there are many more services to add and we’re continuing to work with individual parts of the Home Office to do so. Currently it reflects the services that exist (the ‘as is’), rather than an ideal list of services in future. We think some could be designed out of existence or combined together if we made things simpler, more efficient or more effective. This isn’t a list of everything that this department does, or that the organisations related to this department do. Most large organisations already have ways to list and detail internal capabilities or activities. It also doesn’t represent any services provided by supporting functions such as HR, finance or procurement, even if those functions do interact with end users. Does it reflect something an end user is trying to do and might search for online - for example, visit the UK, not ‘apply for a standard visitor visa’? Does it reflect some kind of policy intent – so it’s trying to achieve a particular outcome (not just a step in a process)? Can something really be described as a ‘service’ if we’re ‘doing something’ to someone, for example ‘being detained’ or ‘going to prison’? Is it something that would happen as a standalone service – something that’s not just part of another process? Currently some services on this list are just part of another process, but they happen at such a different point in time that at the moment we’ve called them out separately. This doesn’t mean it couldn’t be designed differently in future. Is it described in the way an end user would think of it, or search for it online? And not just another way of describing internal activities an organisation does – for example, ‘providing biometrics’ isn’t what we’d consider a service, but a task or activity. Is it delivered only by this department or does it relate to a bigger service that involves multiple government departments? For now, we’ve listed those as ‘bigger service – part the Home Office delivers’, for example ‘Employ someone – check if someone is allowed to work’. We reviewed service content on GOV.UK, looked at research with users to see how people refer to or think about services, and worked with business architects in all main operational areas. We then took an initial draft to stakeholders in strategy teams from each organisation, or with senior leadership where there is no centralised strategy team. Working with business architects we also mapped a version of the list to a deeper level of detail to check to what extent it aligned with existing work on value streams, capabilities or business processes, and to check for gaps. We then involved a much wider group of stakeholders, from senior management to operations and delivery, to make people aware of it and to invite contributions. Content in this list is currently owned by the head of the business design team or authority for each operational area within the Home Office. Where these roles don’t exist, we aim to identify someone within the strategy team for each area. The head of service design and the head of content design uphold standards for the list – for example, naming conventions and what does and doesn’t constitute a service. And a central team within the Digital, Data and Technology function manages updates. In the case of the Home Office, you do need to broaden your definition of a service/E2E Process. "End user" is often not an appropriate term. 'Service Beneficiary' perhaps. This often involves an individual person, or persons, and society. Detention is a good example. You would expect service outcomes to be defined both in terms of the individual and society - protection, improved life options, etc. We define service outcomes in terms of policy (which should be representative of citizen/society needs), organisational (often in terms of efficiency/effectiveness) as well as for users. Each service of course has a network of related user groups, stakeholders and other actors. Across government there’s some standardisation around the word ‘user’ - it’s not meant to indicate the level of proactiveness they play, though most of the services here do reflect what someone is trying to do/get done, rather than a process that starts as a result of their actions. I can see a lot of similarities with the List of Local Government (customer facing) services http://id.esd.org.uk/list/englishAndWelshServices that has been maintained for some 15 years now. In common with that, I'd recommend giving each service a persistent resolvable identifier for reference in documents and relevant datasets. Hello. It is similar, thanks for sharing this list. It differs in terms of how we describe services, I think - we tend to use verbs rather than nouns, to describe what someone is trying to do, rather than internally what the process/activity is called. And yes, it makes sense for this list to be more register-like and have unique reference numbers for use elsewhere, in time. Perhaps you could contribute - link at the top of the page.